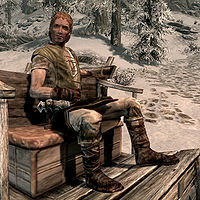 Alfarinn is a Nord warrior, and the Windhelm carriage driver. Alfarinn wears a set of farm clothes, a pair of gloves, and a pair of boots. He is equipped with an iron war axe. If you ask him what he can tell you about Windhelm he'll reply, "It's an old city, I can tell you that. The Palace of the Kings is ancient. It's not the friendliest place for outsiders. The Dark Elves were all forced to live in a slum called the Grey Quarter. The Argonians can't even live inside the walls. They're all stuck out on the docks. Still, Candlehearth Hall's got decent food and cheap bunks. You could do worse." This page was last modified on 9 October 2014, at 23:47.